Download "Compensation. Financial Assistance. Resources. Office of Attorney General. 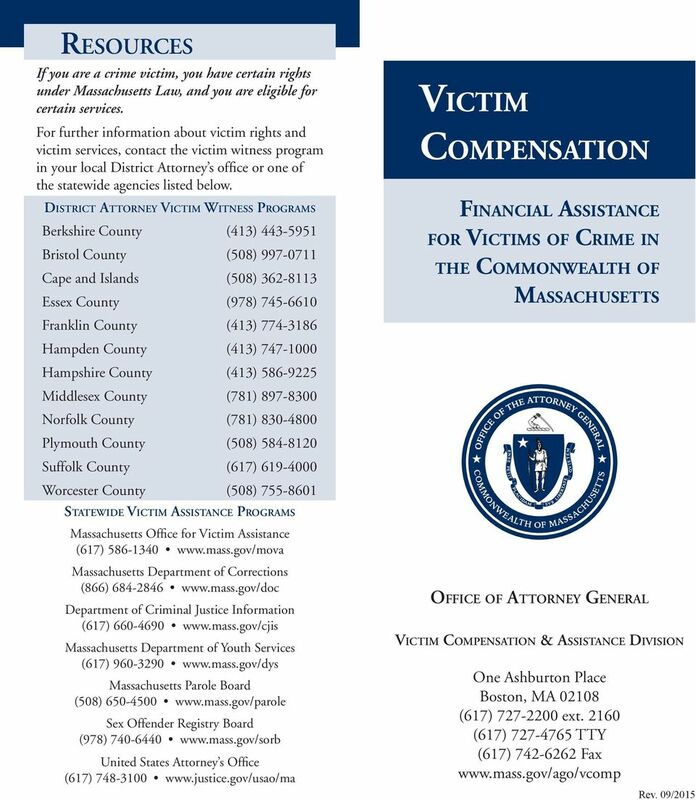 for Victims of Crime in the Commonwealth of Massachusetts"
2 A Message from the Massachusetts Attorney General Violent crime impacts every aspect of a person s life. The resulting physical and psychological injuries can affect a person s ability to work, go to school, and meet their own individual goals and aspirations. Often victims may require treatment to address the injuries caused by the violent acts of another. The monetary expenses incurred after losing a loved one, for medical and dental care, for psychological assistance, and by injuries resulting in a disability to work should not serve to further victimize those who are affected by violent crime. The Massachusetts Attorney General s Office is committed to empowering crime victims and providing them with the tools and support they need to begin the healing process. Our Victim Compensation and Assistance Division is one resource that works diligently to make this happen. We are able to provide financial assistance to eligible victims of violent crime for uninsured medical and dental care, mental health counseling, funeral and burial costs, and income lost due to the inability to work. 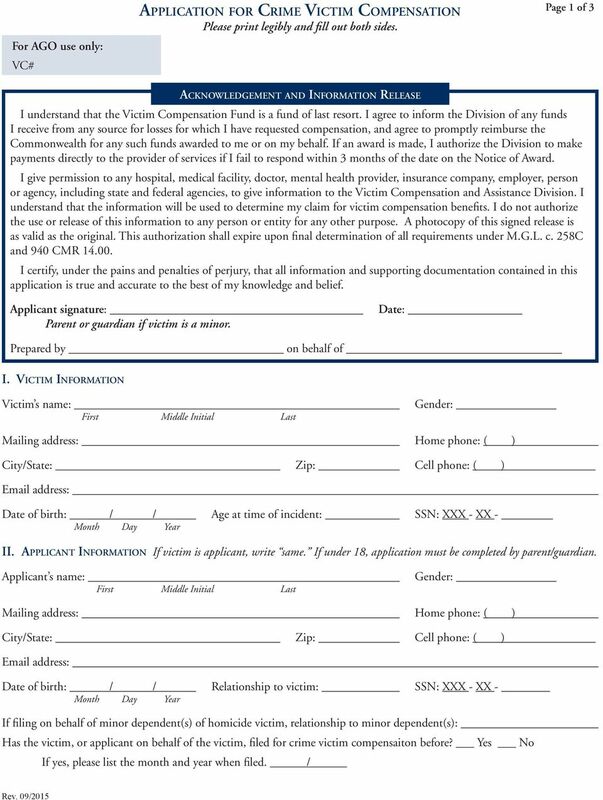 Victims of crimes that occurred on or after July 1, 2013, may, in addition, be eligible to receive financial assistance relating to compensable expenses. Our division uses funds primarily obtained from perpetrators, and can assist with expenses up to a maximum of $25,000 per crime. My experienced staff will assist you in understanding your rights as a crime victim, determining what expenses may be eligible for compensation, and assessing what other resources are available to assist you. 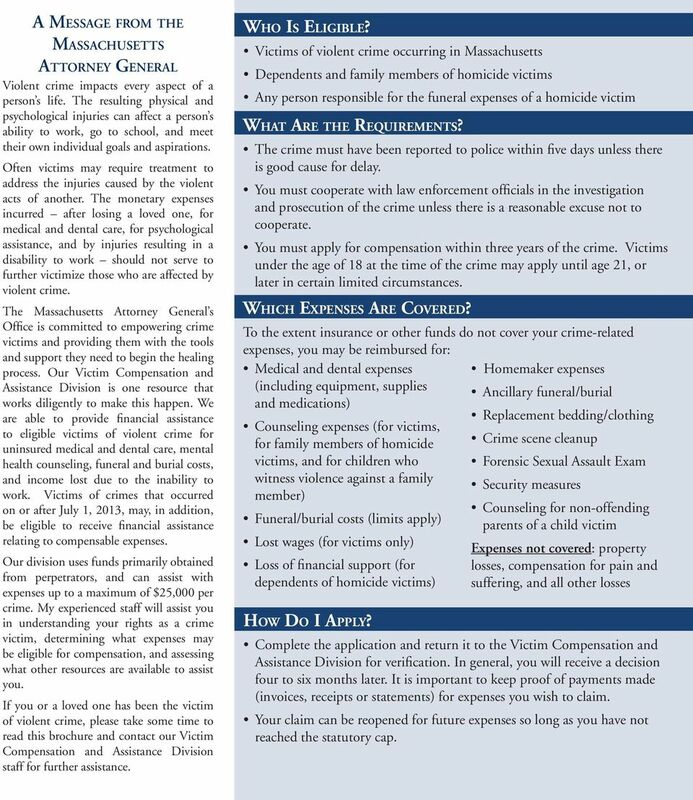 If you or a loved one has been the victim of violent crime, please take some time to read this brochure and contact our Victim Compensation and Assistance Division staff for further assistance. Who Is Eligible? 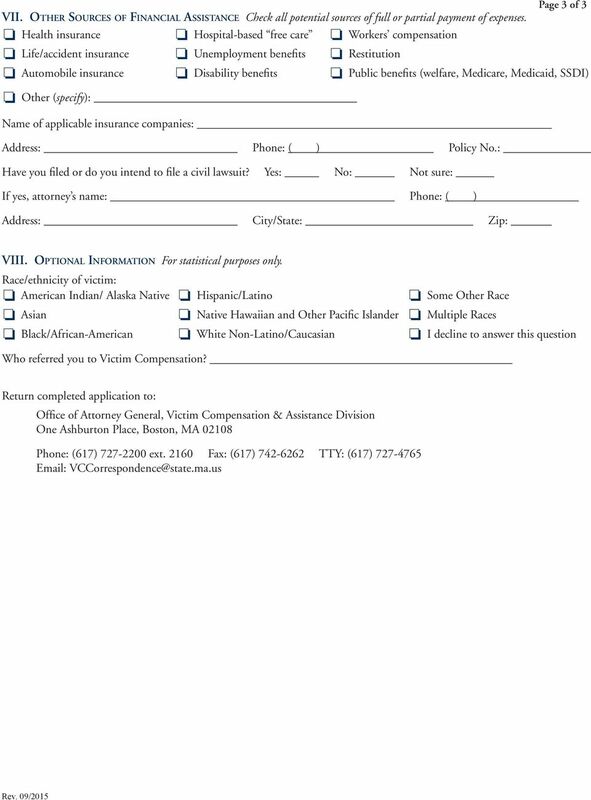 Victims of violent crime occurring in Massachusetts Dependents and family members of homicide victims Any person responsible for the funeral expenses of a homicide victim What Are the Requirements? The crime must have been reported to police within five days unless there is good cause for delay. You must cooperate with law enforcement officials in the investigation and prosecution of the crime unless there is a reasonable excuse not to cooperate. You must apply for compensation within three years of the crime. Victims under the age of 18 at the time of the crime may apply until age 21, or later in certain limited circumstances. Which Expenses Are Covered? 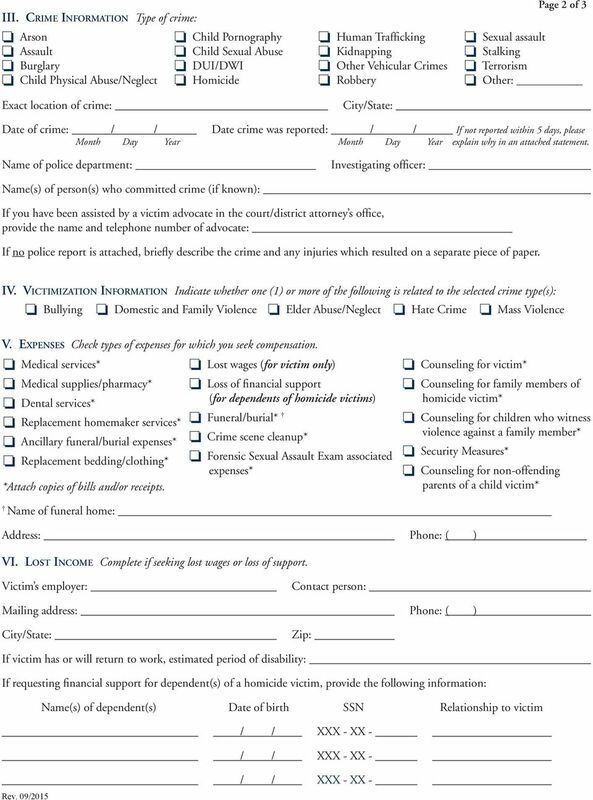 To the extent insurance or other funds do not cover your crime-related expenses, you may be reimbursed for: Medical and dental expenses Homemaker expenses (including equipment, supplies Ancillary funeral/burial and medications) Counseling expenses (for victims, for family members of homicide victims, and for children who witness violence against a family member) Funeral/burial costs (limits apply) Lost wages (for victims only) Loss of financial support (for dependents of homicide victims) How Do I Apply? Replacement bedding/clothing Crime scene cleanup Forensic Sexual Assault Exam Security measures Counseling for non-offending parents of a child victim Expenses not covered: property losses, compensation for pain and suffering, and all other losses Complete the application and return it to the Victim Compensation and Assistance Division for verification. In general, you will receive a decision four to six months later. It is important to keep proof of payments made (invoices, receipts or statements) for expenses you wish to claim. Your claim can be reopened for future expenses so long as you have not reached the statutory cap. This webinar is brought to you by CLEONet www.cleonet.ca CLEONet is a web site of legal information for community workers and advocates who work with low-income and disadvantaged communities in Ontario.